What can you do if you believe a preemployment test is unfair or invades your right to privacy? This can be a perplexing situation. Most job seekers fear that if they question a test and its relevance to the job for which they’re interviewing, they’ll be perceived as difficult or defensive, leaving a negative impression on their prospective employer. However, Bill Banis, who has a Ph.D. in management and industrial/organization psychology and is director of university career services at Northwestern University, believes that job seekers have a right to ask an employer how the test or selection method is related to the job. Most interviewers should be able to give an explanation of why the test is used and how it relates to the job for which the candidate is interviewing. Keep in mind, however, that in order to maintain the integrity of the test, they may not be able to discuss its job-relatedness until after the testing process is completed. For those job seekers who don’t have a career services office to turn to, Toni Kovalski, associate director of test development for the International Personnel Management Association Assessment Services Division, suggests calling the department that administered the test. Job seekers can express their concerns and request some explanation of the test’s job-relatedness. If the job seeker still feels that something was wrong with the testing or interview process, his or her next move will depend on the nature of the complaint. If Banis learns that an employer is using an inappropriate or illegal preemployment test, he will address the situation with the employer. Sometimes illegal interviewing or testing methods enter the hiring process quite by accident. Because of legal and other problems that can result from irrelevant or unfair tests (or tests that have “adverse impact”), be assured that many companies now choose their preemployment tests and interviewing techniques very carefully. In addition, career services professionals such as Banis often review preemployment tests that will be used with student job seekers before interviews begin. Checks and doublechecks are made on the reliability, validity, and job-relatedness of preemployment tests. As Kovalski points out, it is a waste of an employer’s time and money to administer tests that don’t give them the appropriate information about a candidate, which makes it unlikely that inappropriate tests will slip through the review process. When Todd Lombardi sits down to interview a job candidate at Kulicke & Soffa Industries Inc., he has a list of very specific questions to ask, and he knows how to follow them up with more probing questions about how the candidate performed in past jobs and projects. Lombardi, who earned a master’s degree in industrial organizational psychology from West Chester University last May, wrote his thesis on behavior-based interviewing. Now he’s a college relations specialist at Kulicke & Soffa Industries Inc., based in Willow Grove, Pennsylvania, and he says his background has helped him understand an interviewing technique that has become increasingly popular and, according to both his research and popular opinion, more effective than traditional techniques. “It seemed like the more structure and the more thought that was put into an interview, the better it was,” he says. Lombardi says that the best way for students and new graduates to prepare for a behavior-based interview is to dig up old research papers, to think hard about any difficulties encountered in summer and part-time jobs, and to recount the steps it took to successfully complete school projects and projects that were part of internships or co-ops. 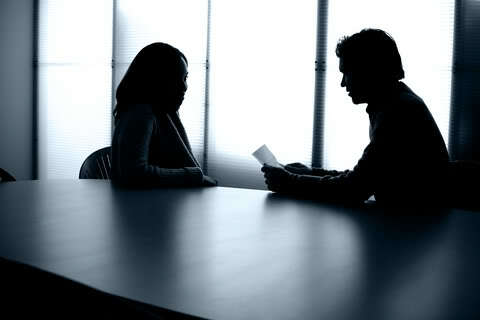 At most interviews, you will be invited to ask questions of your interviewer. This is an important opportunity for you to learn more about the employer, and for the interviewer to further evaluate you as a job candidate. It requires some advance preparation on your part. * Prepare five good questions. Understanding that you may not have time to ask them all. Ask questions concerning the job, the company, and the industry or profession. * Don’t ask questions that raise warning flags. For example, asking “Would I really have to work weekends?” implies that you are not available for weekend assignments. If you are available, rephrase your question. Also, avoid initiating questions about compensation (pay, vacations, etc.) or tuition reimbursements. You might seem more interested in paychecks or time-off than the actual job. * Don’t ask questions about only one topic. People who ask about only one topic are often perceived as one dimensional and not good candidates.